Icebergs are likely to become more common as melting of the Greenland ice sheet accelerates. A giant iceberg off the coast of Newfoundland has drawn sightseers to the small town of Ferryland. But while "Iceberg Alley" is experiencing a tourism boom, the giant 'berg's early appearance might be cause for concern. Icebergs break off from Baffin Island or Greenland every spring and drift down the stretch of water along the coast of Newfoundland and Labrador known as Iceberg Alley. Usually, the best time of year to view icebergs is between late-May and early-June, according Dr. Stephen E. Bruneau, author of "Icebergs of Newfoundland and Labrador." They are actually the most plentiful in April and May, but he notes that the formations are often trapped in sea ice at that time of year. 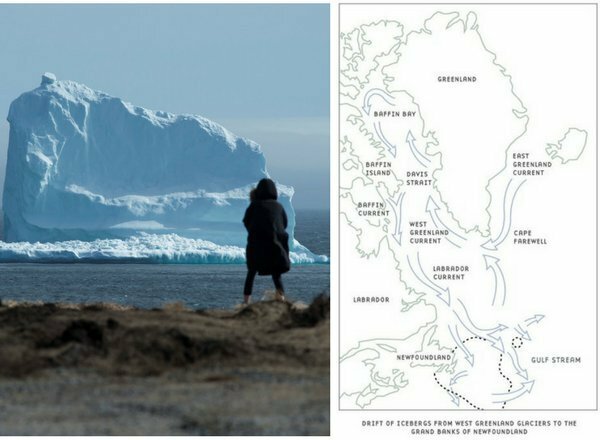 Canadian Ice Service estimated there were more than 1,000 icebergs — including "bergy bits" and "growlers," small 'bergs that are less than 5 metres above the sea level — in Iceberg Alley as of Thursday. The service estimates the number of icebergs in the area through observations from ships, planes and satellite images. Experts are attributing the high numbers to a mixture of uncommonly strong counter-clockwise winds that draw the icebergs south and global warming, which is making Greenland's ice sheet melt faster, according to The Associated Press. Last month, NASA announced that Arctic sea ice hit its lowest level on record. "With climate change, more ice is disbursed into the ocean by the glaciers, effectively increasing the number of icebergs flowing out of Greenland," University of California, Irvine professor Eric Rignot told Vice's Motherboard. Icebergs (although likely not ones as big as the Ferryland 'berg) are likely to become more common as melting of the Greenland ice sheet accelerates. The ice sheet is disappearing at a net rate of 200 gigatonnes per year, which is making the sea level rise by 0.6 millimetres annually, according to The University of Cambridge.